Finally posting these. I gave up on trying to get a good picture of Fresh Teal. Hah! Awesome Orange. Gorgeous neon safety-vest orange creme. Dude Blue. Really nice interesting medium neon blue. Not so sky blue as it looks here- it's closer to the color of the bottle. 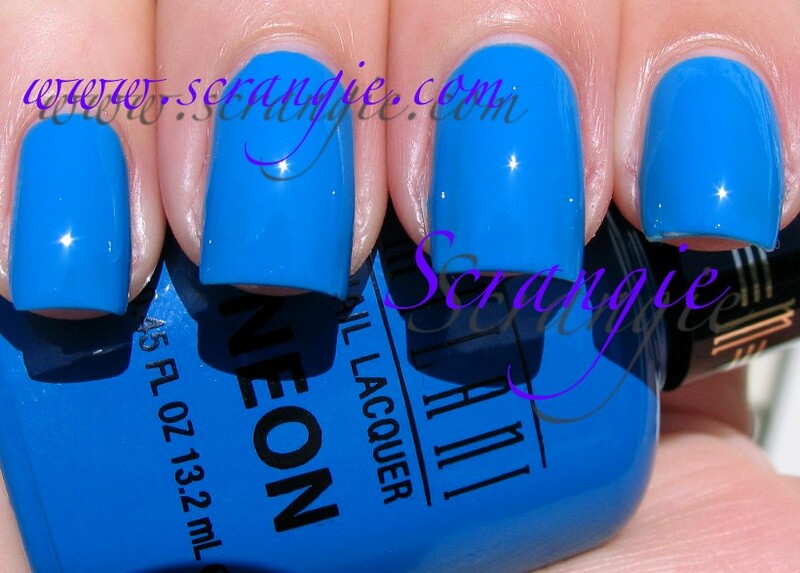 Not the typical neon blue shade, I'm extremely fond of this one. Fresh Teal. The bane of my existence. 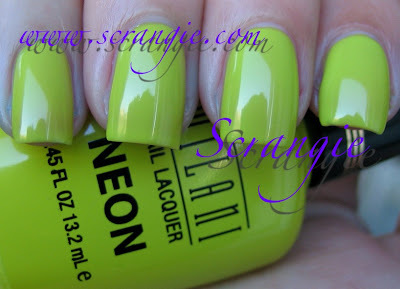 This color is like a lot of other neon greens and teals and does freaky things to the camera when you try to photograph it. These two shots are the best I could get! It's a neon teal. Somewhat like the color of the bottle, but not that dark. 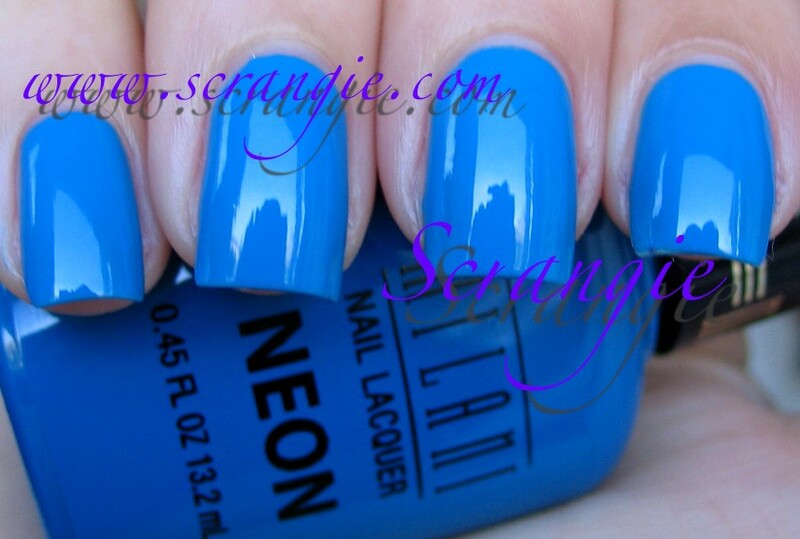 It is not bright blue as it looks here- it is teal. Pink Hottie. The lighter of the two neon pinks. 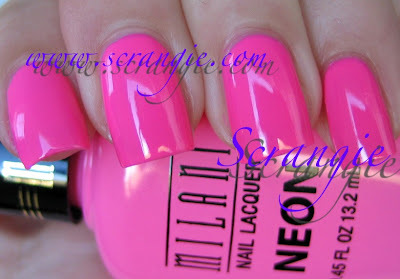 This one is more of a foofy-girly pink cupcake Barbie type neon pink. Highlighter pink, but creamy. Pink Rocks. The darker of the neon pinks. This one borders on being neon red. 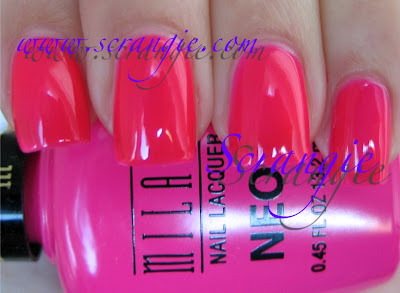 Not as creamy as Pink Hottie or the other neons, this one is more of a jelly finish than a creme. Rad Purple. Also difficult to truly capture, but not hard to describe. 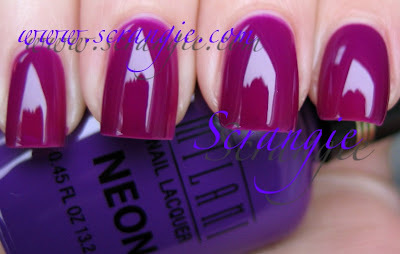 It's the standard 'neon' purple, not quite bright or glowy and not totally purple either. Think Eyeko Purple Polish. Looks nothing like the bottle color, sadly. Techno Red. 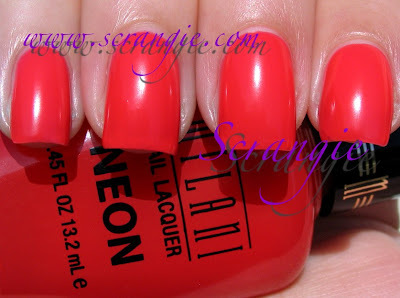 I was hoping this would be more red like the color of the bottle, but it's actually a light pinkish-red coral. 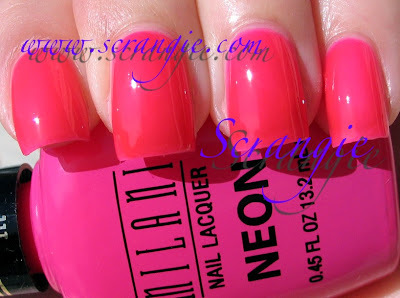 Not super bright either, but still dries matte like a true neon. Totally '80s. This is definitely my favorite. It's such a fun color! It's a lime green and yellow neon. A little weird and murky looking, not a super crisp color. It is totally 80s, but also totally 90s. I used to have a slap bracelet this color. Reminds me of one of those OPI Shrek colors, but brighter. Fiercely Fiona, maybe? I can't remember the names now! The first thing that I need to mention about these is that the bottle is opaque. The color you see on the bottle is actually painted onto the glass and it doesn't necessarily represent the actual color of the polish. This is annoying for many reasons, mainly that you have to open the polish in the store to see what color it really is. The formula on them was good but a little thin. I did three coats of all, some needed it, some didn't. Drying time was a little on the long side for neons which generally dry pretty fast. 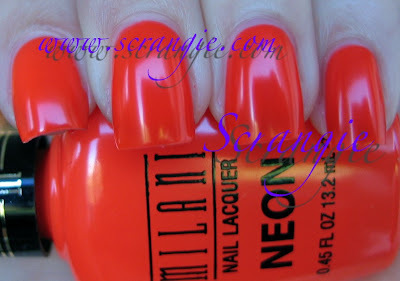 Since they are neon, they dry to a matte finish (they do not have the application or wear issues of traditional matte polish). Do not worry- it's supposed to do that. 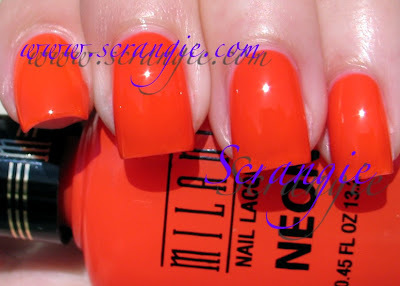 If you like the matte look, leave them as-is, but if you like them glossy, use a topcoat. These aren't terribly unique, but it seems hard to make a truly unique neon. Totally 80s doesn't look like most of the neon greens and yellows out there so that's my top pick. Not a bad collection of neons and they're easily accessible. I'm pretty sure these are permanent colors, at least in my area. 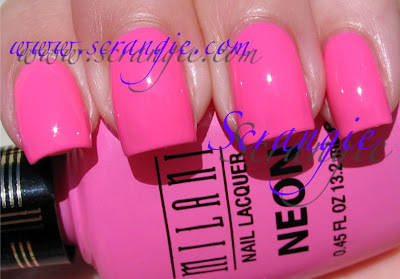 All the Milani displays have permanent shelves for the neons and the 3-D holo ones. 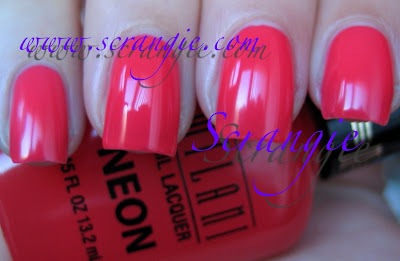 HHmmm I like neons but to release a whole neon collection now is just odd. The bottles being colred is pretty odd too. Why would they do that? That being said I really love the blues and the pinks. They look really fun and just pretty. I've seen these around a lot but never picked them up. I really like the purple but I'm disappointed that it's not the color of the bottle. Thanks for the review. painted bottles, what kind of weird deception is that? Colors are nice, but I've seen to many like those to be extatic about them. Love that you did these swatches, and funny also coz I'm wearing the neon orange (which is gooorgeous) with spider web on ring finger and spider on point finger painted in black. I have the entire collection and was attracted by the color of the bottles. Fresh Teal looks a lot like Color Club Bizerk Turq. They're all so cool! I really need to have Dude Blue, for the color but also for the name, haha! Fresh Teal is really pretty, too! I bought the purple when it first came out and was SOOO disappointed when I realized that the bottle was opaque.